At the Western Minnesota Steam Threshers Reunion in Rollag, Minnesota in early September, Bill Forester of Versailles, Missouri showed off a 100-year-old Minneapolis Threshing Machine Co. tractor that he has helped to completely restore during the last few years. As Detroit Lakes Online reports, the tractor is no longer used for its original purpose, but by restoring the old machine, Forester and his team proved a valuable point: Just because something is old and has been used before doesn’t mean that it can’t still function and be put to good use. 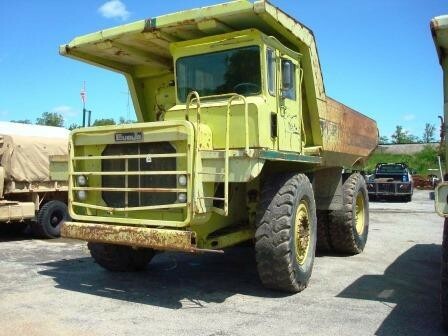 If you are in the market for a dump truck, an off-road truck, a trailer or some other kind truck or equipment for use at a quarry or drilling site, you should know that you don’t have to buy something that’s brand new. There are plenty of great used industrial truck options available here at Rackers Equipment, where we carry a large selection of used vehicles in our inventory that will help you get any job done. By going with used equipment, you can cut your costs significantly and, as long as you take care of used equipment and service it properly, it will last you for a long time. You shouldn’t be scared off by the idea of going with something that’s used. Instead, you should look at it as a great opportunity to save money and to put a piece of heavy-duty equipment back on the job site so that it can do what it was intended to do in the first place. Rackers Equipment’s used inventory is second to none, and we guarantee that we have something on our lot that will make your life easier if you work at a quarry or drilling site. Come check out what we have to offer today or call us at 573-635-8700 to speak with a representative about how used equipment can help you and your business to thrive.